Um die ungebrochen starke Nachfrage nach Klavierliteratur dieser Art zu befriedigen, wurde der Band I der „Russischen Klaviermusik“ (SIK 2409) mit leichten bis mittelschweren Stücken von Komponisten aus Russland und den Ländern der ehemaligen Sowjetunion zusammengestellt. During the course of nearly three decades, the German version of the “Russian Piano School” has developed into a standard work for piano instruction. The work, edited by Julia Suslin, is published in two volumes (SIK 2353 and SIK 2354) and a supplement (SIK 2379). 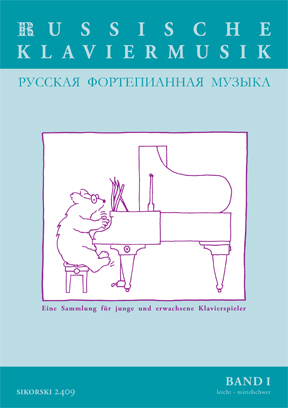 The “Russian Piano School” is available either with or without audio CDs on which the pieces contained within are recorded. In order to satisfy the great demand for piano literature of this kind, the first volume of the “Russian Piano Music” (SIK 2409) has been compiled with easy to moderately difficult pieces by composers of Russia and the countries of the former Soviet Union.